The way Donald J. Trump tells it, his first solo project as a real estate developer, the conversion of a faded railroad hotel on 42nd Street into the sleek, 30-story Grand Hyatt, was a triumph from the very beginning. But that book, and numerous interviews over the years, make little mention of a crucial factor in getting the hotel built: an extraordinary 40-year tax break that has cost New York City $360 million to date in forgiven, or uncollected, taxes, with four years still to run, on a property that cost only $120 million to build in 1980. The project set the pattern for Mr. Trump’s New York career: He used his father’s, and, later, his own, extensive political connections, and relied on a huge amount of assistance from the government and taxpayers in the form of tax breaks, grants and incentives to benefit the 15 buildings at the core of his Manhattan real estate empire. Since then, Mr. Trump has reaped at least $885 million in tax breaks, grants and other subsidies for luxury apartments, hotels and office buildings in New York, according to city tax, housing and finance records. The subsidies helped him lower his own costs and sell apartments at higher prices because of their reduced taxes. While it is impossible to assess how much Mr. Trump pays in personal or corporate income taxes, because he has refused to release his tax returns, an examination of his record as a New York developer shows how aggressively he has fought to lower the taxes on his projects. Mr. Trump successfully sued the administration of Mayor Edward I. Koch after being denied a tax break for Trump Tower, his signature building on Fifth Avenue. Two decades later, in a lawsuit that spanned the administrations of Mayors Rudolph W. Giuliani and Michael R. Bloomberg, he won a similar tax break for Trump World Tower, a building on First Avenue with some of the city’s highest-priced condominiums in 2001. The tax breaks for those two projects alone totaled $157 million. The tax break at the 44-story Trump International Hotel and Tower at Columbus Circle came to $15.9 million. No possible subsidy was left untapped. After the terrorist attacks on the World Trade Center, Mr. Trump lined up a $150,000 grant for one of his buildings near ground zero, taking advantage of a program to help small businesses in the area recover, even though he had acknowledged on the day of the attacks that his building was undamaged. “Donald Trump is probably worse than any other developer in his relentless pursuit of every single dime of taxpayer subsidies he can get his paws on,” said Alicia Glen, Mayor Bill de Blasio’s deputy mayor for housing and economic development, who first battled Mr. Trump when she worked in Mr. Giuliani’s administration. 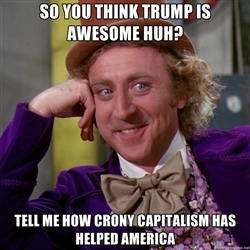 In seeking those subsidies, Mr. Trump is not that different from many other developers. But the level of subsidies he has received along with his doggedness in claiming them seem at odds with his rhetoric as an outsider candidate who boasts of his single-handed success and who has denounced what he calls the pay-to-play culture of politics and a “rigged” system of government. There is much more detail in the full article. Donald Trump has threatened to sue the New York Times. The tweet marks Trump’s latest attack on the press although litigation is unlikely to succeed. Under the precedent set by the Supreme Court in the landmark case of New York Times v. Sullivan in 1964, any public figure suing for libel must prove a defamatory statement was made with actual malice, “with knowledge that it was false or with reckless disregard of whether it was false or not”. Besides thinking they are disgusting, I think it is safe to say that Donald Trump also thinks they are losers.